- Please read the SIZE and the PRICES of the products before buying, if you have any questions, please send us an email. Do not buy the product if you are not sure of the exact measures. Please feel free to contact us any time. - We do not accept any returns longer than 30 days after receiving the item. Returns should have reasonable reasons, among which are: incorrect size, incorrect product, exceeding 15 days in shipping, or product in a very bad condition. - We make the products one by one and these products are cut on computerized machines, the measurements are almost exact, we have a margin of error of 1/8". - We guarantee that the product you buy is the one you will receive, with the size/color/material specific. - All our products have delivery time of 15 days maximum, We try to send your product as fast as possible, in many cases this time is very short. - The customer is responsible that his mailbox can receive packages, as we do not ship to P.O. boxes. - The customer is responsible for reading the notes left by the shipping companies. - We trust in the veracity of the shipping companies, when they tell us that the package is delivered. Baltic Birch Plywood Drawer Side Pre-Finished With 1/2" Thickness. 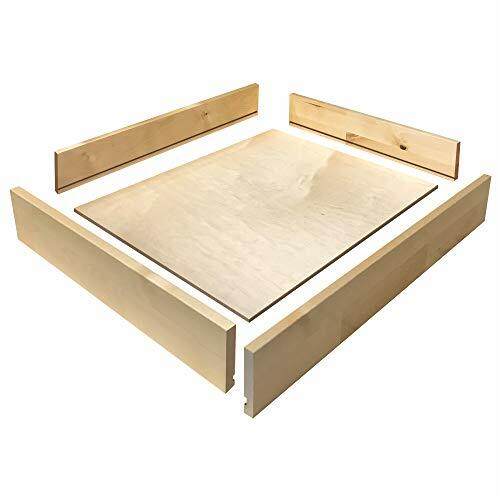 Includes only (1) drawer box pack without any accessory, Glue/screws/nails not included.